For over 25 years, Wilson's Natural Landscaping, LLC. 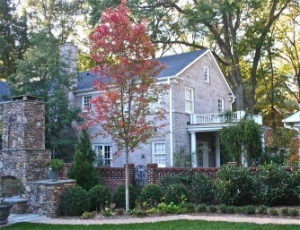 has been providing quality landscape design services throughout North Carolina. Each project begins with a meticulous design process to ensure that we create a finished product that not only meets your needs, but is one that you will love and enjoy for a lifetime. You can trust our highly trained team of experts to transform your space into one where you truly enjoy spending your time. Every project begins with a walkthrough of your property to determine your needs. We want to find out how you envision using your space- whether you need more room for children to play, a space for pets to run, a patio for entertaining, a quiet retreat amongst nature to relax, or a privacy screening from your neighbors. 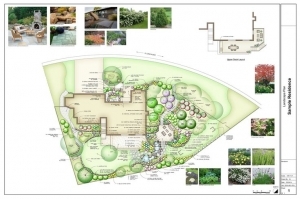 We pay special attention to the details with design issues that you may not have thought about, and offer innovative and environmentally friendly solutions as part of your landscape plan. We also aim to get a sense of your aesthetic preferences so that we are able to implement the perfect design for you and your family. After the initial consultation, we conduct a thorough site analysis and create a scaled drawing. We'll look at potential drainage issues and offer remediation. We measure changes in grade and elevation, and take notes of existing plants and features, as well as the aesthetics of your home so that we can create the perfect design for you. Once the site analysis and initial walkthrough have been completed, we'll combine the information that we've gathered with our extensive knowledge of plants and landscaping materials to design your landscape. As horticulturalists, we understand how to choose plants that are native to the North Carolina climate so that your landscape will look beautiful year-round, and be filled with vibrant color, texture, and fragrance. Our team of experts strive to create designs that are practical, functional, beautiful, and capture the artistic principles of lines, space, texture, balance, and proportion to create a lush garden setting. Once the design has been completed, the designer will meet with you to present the plan and do another walkthrough of your property so you can visualize how our design ideas will fit together. We will continually work with you to revise the project until we have created your perfect landscape. After the design has been finalized, we will provide a cost estimate for your project and if you accept, we will schedule the installation promptly. Your designer will act as project manager throughout the job to ensure that the work is installed as planned and on schedule. Our crews take great pride in their work and pay very close attention to detail in all phases of the job. A foreman will be on site at all time and your designer will be there to check in periodically to ensure that installation goes smoothly. Our crew's dedication to craftsmanship is reflected in the beauty and quality of your finished landscape. 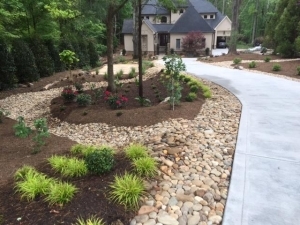 To get started on your landscape plan, send us an email at info@wilsonsnatural.com, fill out the information on our Contact Us page or give us a call at 704-888-4635.